As predicted, the net is being closed on Tower Hamlets Council’s East End Life. I hinted that ministers were considering further action against it and other similar council papers and now we have it on record. On 13th October 2011, the Bethnal Green and Bow Conservative Association were joined by Bob Neill MP, Minister for Local Government, to talk about a range of issues affecting the London Borough of Tower Hamlets and the wider East End area. The Minister expressed his disappointment at the local Mayor’s decision to continue publishing its weekly municipal newspaper, East End Life, in spite of the Government’s strict new guidelines. “It was a pleasure to spend time with Conservative colleagues in Tower Hamlets who are so passionate about East London and they have some fantastic ideas about how the area could be improved for current and future generations. “It is deeply frustrating that the Mayor of Tower Hamlets continues to plough £1.5 million a year of local taxpayers’ money into his weekly vanity paper, East End Life, despite representing one of the most deprived areas of the Capital. Councils should be there to deliver key services for residents – not divert public money into publications which undermine independent local papers and do little but self-congratulate the ruling establishment. Tower Hamlets Conservatives held a dinner on Thursday 13th October at the Market Coffee House, Spitalfields at which Bob Neill MP, Minister for Local Government was the speaker. It updates the previous Publicity Code introducing new provisions on the frequency, content and appearance of local authority newspapers, in particular that they should not be issued more frequently than quarterly. Jim Fitzpatrick secured an adjournment debate in the Commons last night on the bid by Tower Hamlets for City Status in the Queen’s Diamond Jubilee year. When this bid was first announced, I was a bit cynical about it, a little too cynical in retrospect. It’s certainly being driven by Canary Wharf Group but it also has the backing of the Corporation of London which some thought would be worried about the E14 Parvenus gaining similar banking ranking. The 25 towns applying for city status are: Bolton, Bournemouth, Chelmsford, Colchester, Coleraine, Corby, Craigavon, Croydon, Doncaster, Dorchester, Dudley, Gateshead, Goole, Luton, Medway, Middlesbrough, Milton Keynes, Perth, Reading, Southend, St Asaph, St Austell, Stockport, Tower Hamlets and Wrexham. As I went to school for a bit in the small town St Asaph in North Wales, which already has a cathedral, grew up not far from Wrexham and worked for three years in Colchester, the list is a little trip down memory lane. Some think Tower Hamlets has a fine chance and although the Queen will always be mindful of, as her mother put it, “looking the East End in the eye”, I’m sure the Palace would believe it to be a too London-centric decision. Many feel Reading is the frontrunner but if I were advising the Palace, I’d go for Gateshead or Middlesbrough which have been beacons of regeneration of the industrial North. That said, nowhere has a history like Tower Hamlets and this was highlighted with great pride by Jim in the Chamber last night. Adjournment debates are the last of the day and as such, the Commons is usually pretty empty. But what a shame that Jim was the only Labour MP in the Chamber last night. Not even Bethnal Green and Bow MP Rushanara Ali, whom the Speaker had promised would be allowed to say a few words, could make it. In fact, it fell to Mark Field, the Tory MP for the Cities of London and Westminster, to rise up in support of Jim’s speech. Mark also said that Croydon was a strong contender and a bit later on hinted at the point that I wrote about here last month, that the unseemly political climate in Tower Hamlets could end up damaging the cause. I think he’s right and if the borough does fail to win, I do wonder whether Labour and Lutfur Rahman will try to pin the blame on each other. Jim Fitzpatrick (Poplar and Limehouse) (Lab): I am grateful for the opportunity to raise the Tower Hamlets city status bid, and I welcome the Minister. I know that his reaction must be neutral, so in reality, this will not be much of a debate. It is none the less good to see him—he is highly regarded on both sides of the House. It is also good to see the hon. Member for Cities of London and Westminster (Mr Field) in the Chamber. He represents London’s existing two cities. My hon. Friend the Member for Bethnal Green and Bow (Rushanara Ali) and I—she cannot be with us tonight—would be very happy were Her Majesty to allow us to represent just one city between us. Perhaps the hon. Gentleman can offer us some advice and assistance on how to get there. The east end has always been special in many ways. Today, however, Tower Hamlets is a reflection of Britain and the Commonwealth—a centre for global business and multiculturalism. The borough has come a long way since the blitz. Tower Hamlets has been transformed during the decades of Her Majesty’s reign, adapting from the industry of the docks and the merchant navy to become an internationally recognised world centre for trading, business and banking, and a celebrated tourism hub. We have over two millennia of history and share more than a thousand years with royalty. Now as before, but in a different way, we are a powerhouse for the United Kingdom’s well-being. We are the third central business district for the heart of London, alongside London’s west end and the Corporation of London, both of which cities are represented by the hon. Member for Cities of London and Westminster, as I have said. Our new economy creates an economic surplus that contributes through Government tax distribution to many of the poorer parts of Britain. We are proud to be able to make that contribution, having experienced hard times ourselves in the past—we still have deprived areas today. On the history of our part of east London, the iconic Tower of London symbolises our strong and enduring links with the monarchy. Founded by William the Conqueror, it is the country’s oldest royal palace. The constable of the tower has the right of direct access to the sovereign, and of course it is home to the Crown jewels. London’s first public park in 1850, and named after Queen Victoria. A petition signed by 30,000 residents requested a royal park in the area because of the lack of green space in the east end. “I am glad…now we can look the East End in the eye”. In 1945, during two days of joy following VE day, the royal family celebrated with Poplar and Limehouse. The royal family has maintained its links with the east end, and family members have taken an active interest in the area’s regeneration. The Prince’s Trust has been an assiduous partner in local initiatives, and Her Majesty herself opened the first stage of the Docklands light railway in 1987, and Poplar marina a decade later. She and His Royal Highness Prince Philip have also visited on other occasions. The ecumenical priorities of the royal family are a basis of staunch support from Tower Hamlets, as a multi-faith community. This was demonstrated at the recent royal wedding celebrations, which were organised and attended by people from all religions and backgrounds. Our prosperity as London’s engine room has always been linked with London’s priorities as the nation’s primary trading centre, and now as a world city. We have moved from physical trade to international banking, creative industries, media, pharmaceuticals and company headquarters, and Tower Hamlets is now a leading world centre, with the City Fringe and Canary Wharf. Our economic turnover is now over £6 billion annually. Small and medium-sized enterprises on, and servicing, Canary Wharf, as well as traditional businesses, provide employment for thousands of people. Our inward-commuting population is more than 120,000 daily, and will rise to more than 200,000 by 2020. There will be 300,000 jobs in Tower Hamlets by then. Already, Tower Hamlets offers the largest number of jobs in the United Kingdom outside the cities of Birmingham, Leeds, Manchester and Sheffield, and London’s two other cities. The Thames and Lea rivers, and the legacy of the Roman roads, were our early business arteries and our communities’ raison d’être. We still have the largest “blue network” of any London borough. The upper docks were a vital part of Britain’s maritime trade from the 1800s to the 1970s. London’s first canal—the Regent’s canal or Prince Regent’s canal—and early railways such as the London and Blackwall were built to serve the docks and carry national, imperial and international trade. Our markets, including Spitalfields, were the centrepiece of the capital’s provisioning. In 1982, Billingsgate fish market relocated to Tower Hamlets. growth environmentally in the decades to follow, and 170 million passenger journeys start or finish at our 30 stations yearly. Tower Hamlets has a fascinating social, cultural and political history. A core test of strong community leadership is an enduring concern for the well-being of its citizens of all ages. Trade and social cohesion do not always rub shoulders comfortably in a major urban area. Poverty, slum housing, poor health and crime have all been present locally and, sadly, some aspects are still evident. Tower Hamlets council and its predecessors have a distinguished and continuing tradition of increasing democracy and rights for working people, including the Poplar rebels of the 1920s. The roll call locally is packed with social reform, equality, emancipation and self-improvement of communities, transforming them into our 21st century society. In the middle ages, Wat Tyler met King Richard II at Mile End during the peasants’ revolt, where the king acceded to a petition for better payments and social conditions. In Victorian times, the Chartists and local dockers, campaigning to improve industrial and social conditions, met at Victoria park. The Toynbee Hall organisation has worked on social and welfare reform since the end of the 19th century. Clement Attlee MP, one of my predecessors, was MP for Limehouse and became Prime Minister, championing welfare reform. In early 2011, the current Prime Minister announced the coalition Government’s plans for welfare reform at Toynbee Hall. The Boundary estate in Bethnal Green opened in 1900 and was the world’s first council housing, built on the site of one of the capital’s most notorious slums, the Old Nichol. The Peabody estate in Commercial street was the first social housing, while the Lansbury estate in Poplar was a post-war prototype and is still going strong. Sylvia Pankhurst settled in Bow at the beginning of world war one. With suffragette colleagues, she set up a cut-price restaurant, a milk centre, a toy factory and a nursery school. This provided local women and children with what they needed; the women worked in the munitions factories and on public transport, as their husbands and men-folk went to war. In other examples, the first women to form a trade union did so at Bryant and May’s match factory in Bow; the Salvation Army was founded by Charles Booth in the east end; and Mahatma Gandhi stayed in Kingsley hall in Bow in 1930s—a place that now houses the Gandhi Foundation. arrival of Bangladeshi Muslims. These new communities, defined by their faith and ethnicity, have created strong infrastructures around family and work—firm foundations for our city. The diverse population, cultures and identities reflect those of the wider 21st-century Britain. We now have the youngest population of any London local authority. That rich background has stimulated a shining example of Tower Hamlets’ distinctiveness. One building that best tells the diverse religious history of Tower Hamlets, is the “Brick Lane mosque”, which was originally founded as a church for the Huguenots, but later used by Methodists. In the late 19th century, it was converted into the Machzikei Adass, also known as the Spitalfields Great synagogue, but as the Jewish community moved out to be replaced by Bengali immigrants, it became the Jamme Masjid or the Great London mosque in 1976. We also have the east London mosque in Whitechapel and no less than three Hawksmoor churches in the borough. Royal ensigns have permission to fly—the white ensign at St Anne’s in Limehouse, the red ensign at St Dunstan’s in Stepney, as well as the blue ensign at the floating church of St Peter’s in the docks. Most recently, the regeneration of the area, overseen by the London Docklands Development Corporation, has caused the riverside populations to be reborn, with renovations and adaptation of older buildings and the construction of new homes, bringing many thousands of new residents to the area. That stimulation and new investment has extended inland to centres such as Spitalfields, Whitechapel, Bow and Victoria park—and, of course, Tower Hamlets is one of London’s Olympic boroughs. Tower Hamlets’ experiences with community activism in past times are paying dividends as we look to the future. At the 1936 battle of Cable street, 300,000 people blocked Oswald Mosley’s fascists from marching on the local Jewish community. Today there are some 2,500 community groups working within Tower Hamlets, delivering a vast range of services to local people, ranging from small self-help groups run by volunteers, to larger organisations delivering public sector contracts. Our thriving third sector is a reflection of our vitality and community spirit, which is inspired by our origins. There was stability in Tower Hamlets during the riots that took place elsewhere in the United Kingdom during the 1980s and 1990s, and most recently we were pretty much spared the violence seen in so many parts of the UK. The sustaining core of the east end’s future will be our young people, and ensuring that they are educated, skilled, experienced and adaptable. Our secondary schools are benefiting from a £290 million investment to create world-class learning environments for our children. Our schools have moved in the last 15 years, and are now among the highest-performing in Britain. Education and training-related courses can be taken in the borough’s idea stores—formerly libraries—and higher educational opportunities are available in Tower Hamlets at Queen Mary and Westfield college, part of the University of London, at London Metropolitan university, and at Tower Hamlets college. turnout of 52.4% of young people, a higher turnout than those in some recent mainstream elections. We have a directly elected executive mayoral system of local government. Tower Hamlets has always had a high-profile artistic identity. Among our residents are Dame Helen Mirren, Sir Ian McKellen, Tracey Emin and Gilbert and George, and 3 Mills Studios in Bromley-by-Bow are London’s largest film and television studios. The Old Truman Brewery is now host to many creative businesses, and we have a number of artists’ colonies including Trinity Buoy Wharf, where Faraday experimented with electricity. For over a century the Whitechapel gallery has showcased the work of world-renowned artists such as Picasso, Jackson Pollock and Lucian Freud. The Museum of London Docklands is considered to be one of London’s hidden treasures, and addresses the history of the capital as a port. Children locally are encouraged to visit the V&A Museum of Childhood, which was opened by the Prince of Wales in 1872, to see its collection of childhood-related objects dating back to the 1600s. Wilton’s Music Hall, which opened in 1858 in Wapping, is the oldest surviving Grand Music Hall in the world, and is Grade II listed. However, the jewel of all our buildings is the one that I mentioned at the start, which is home to the Crown Jewels. One of Britain’s most striking and famous historical landmarks, the Tower of London, is now a world heritage site attracting more than 2 million visitors a year. Other high-profile buildings include the Canary Wharf skyscrapers, the Old Truman Brewery, the old and new parts of the Royal London hospital, the northern half of Tower Bridge—I would not want to claim Southwark’s southern half—and the Whitechapel Bell Foundry, which cast the Big Ben bell, as well as the bells of many cathedrals and parish churches and others further afield. I am told that it also cast the Liberty Bell, which, as we know, is famously cracked. During the American quadricentennial celebrations, a stunt was organised by Americans who handed out leaflets outside the foundry asking for their money back. The foundry showed its sense of humour: they were told that they could certainly have their money back provided that the goods were returned in the original packaging. Some of our street markets are known worldwide and are major destinations for residents, Londoners and tourists alike, such as the Columbia Road flower market and the Whitechapel, Petticoat Lane, Spitalfields and Billingsgate markets. The Roman Road, Watney and Chrisp Street markets are well known throughout the east end. Food is a symbol of Tower Hamlets’ many cultures, whether it is sold in the local pie and mash shops, at Tubby Isaac’s jellied eel stall, in the bagel bakeries or in the curry houses. The Olympic organisers have just named Brick lane as Curry Capital 2012. Events take place in Tower Hamlets throughout the year. The Baishakhi Mela, a festival to celebrate the Bengali new year, is the largest carnival in the UK after the Notting Hill carnival, and more than 100,000 people turned up in 2010. Lovebox, a music festival held in Victoria park, attracts star performers and plays to over 100,000 people, and Canary Wharf sponsors a year-round arts and events programme encompassing music, sport, visual art, food, fashion and dance. Tower Hamlets is in very good company, and whichever area Her Majesty chooses will be worthy of the title. My speech is intended to draw attention to some of the stronger reasons for the view held by many of us that Tower Hamlets has an excellent case to make. Our bid has the support of all our major political parties. A city is defined through its deeds, its concern for citizens and its central roles. We have a powerful track record of managing and behaving as a city, with national and world impacts in business, and a profound and strong cultural and social record at a human level. We hope that Her Majesty will choose Tower Hamlets because we foresee more investment and economic growth coming from city status with its new united identity. These gains will be re-invested back into our communities and our people, and towards the wider London and national well-being. Our vision is built on our multicultural, multi-faith approach to social development, and our aim to be the leading example of how Britain can best influence the dynamics of the world in the 21st century, and I am grateful to have had the chance to make these remarks. Mr Mark Field (Cities of London and Westminster) (Con): I congratulate the hon. Member for Poplar and Limehouse (Jim Fitzpatrick) on introducing this important debate. As he pointed out, I, rather greedily, have two cities in my constituency just to the west of his own. They are also rich in history, and I suspect I could bore Members for some hours by going into the details of that history. It was a great pleasure to listen to the hon. Gentleman’s speech, in which he described, with understandable pride, the great achievements of Tower Hamlets. Although he spoke about its great history, he also had a firm eye on the future. In light of the previous debate, it might be relevant to mention that one thing Tower Hamlets lacks is a league football club. We might, perhaps, hope that returns to its historical roots at some point by crossing the river again—although I suspect the local constabulary might not be too keen on that idea, particularly on derby days when Millwall plays West Ham United. However, although the hon. Gentleman made relevant points about Tower Hamlets, I hope we will consider granting city status to other candidates too, so that we do not give the nod to just one new city next year. Reading is my home town, and that is one of the other places in the running, and I also think there is a strong case for Croydon. If it were a self-standing entity rather than a London borough, it would be the ninth largest settlement in the UK. The case for Tower Hamlets is strong. As the hon. Gentleman pointed out, the financial district that has grown up from nothing over the past 20 years makes a great case for its having city status, and so does its great history. For those purists who want there to be a cathedral, there are the three Hawksmoor churches. St George-in-the-East and the others would all happily fit the bill. However, the hon. Gentleman’s most important statement in promoting Tower Hamlets was that we should look to the future. The great multicultural, multi-ethnic and multi-racial mix that is Tower Hamlets, with the great change we are seeing in that part of our capital city, deserves to be recognised as an example of how our cities should be. The hon. Gentleman referred to some of the political controversies and difficulties of the 1920s and 1930s, when Poplar was one of the constituent borough councils of Tower Hamlets. Tower Hamlets has also had more recent political problems, and I hope that the prospect of city status will unite all political people in Tower Hamlets over the next year or so. I hope they will focus on that, rather than on some of the high profile difficulties of the recent past. I wish the hon. Gentleman Godspeed with his campaign and look forward to hearing the Minister’s response to what has been an excellent short debate. The Parliamentary Secretary, Cabinet Office (Mr Mark Harper): As well as the hon. Member for Poplar and Limehouse (Jim Fitzpatrick), whom I congratulate on securing this debate, and my hon. Friend the Member for Cities of London and Westminster (Mr Field), two other Members are present, both of whom have an interest in that their own areas are bidding for city status. They will have listened with great interest to the hon. Gentleman’s case. The hon. Gentleman follows my hon. Friends the Members for Croydon Central (Gavin Barwell), for Reading West (Alok Sharma), for Southend West (Mr Amess) and for Gillingham and Rainham (Rehman Chishti) in securing a debate on his area’s hopes for winning city status in the diamond jubilee competition for civic honours. I have learned many new things in the course of this debate, as I did in those previous debates. I think I am right in saying that this is the first such debate for which you, Mr Speaker, have been in the Chair. You will be pleased to know that there are 25 entries seeking city status. This is the fifth debate, so there are a further 20 debates to go if Members are as assiduous as those whom I have mentioned in seeking to make the case for their areas. The hon. Gentleman will be pleased to learn that I can confirm that Tower Hamlets’ entry into the diamond jubilee competition for civic honours has been safely received. As I said, it is one of 25 entries seeking city status and there are 12 entries seeking lord mayoralty status for existing cities. That shows a tremendous amount of enthusiasm and interest in the competition, and demonstrates how attractive such civic honours are to local communities. The hon. Gentleman recognised at the beginning of his remarks that I can no more endorse the aspirations of Tower Hamlets than I could those of any of the other entrants in the competition. Ministers must remain impartial, as we must ensure that bestowing city status remains a real honour, fairly bestowed and that this remains a real competition. The reason why fairness is so important is that there are no hard and fast criteria for becoming a city. It is an honour granted by the sovereign, nowadays following a competition, as a rare mark of distinction. So reasons for success or failure in these competitions are never given, and city status is not something that towns can achieve just by ticking off a list of hard and fast criteria. universities, airports, underground systems or trams, whereas some may lack those physical features but boast a vibrant cultural life. entry will receive a thorough and impartial appraisal of its merits, alongside the other entries in the competition. The assessment process is under way and the plan is to announce the results early in 2012, at the beginning of the diamond jubilee year. With that, this short debate—it was not much of a “debate”, in the sense that there was not a huge difference of opinion—comes to an end. I again congratulate the hon. Gentleman for setting out very forcefully the case for his constituency. On New Year’s Day, I posted this on this blog and entitled it “Tower Hamlets council starts to get a grip.” I said the council should be congratulated for finally taking the initiative in vetting people before helping to promote them. The post concerned a Raising the Nation event at the Brady Centre in Whitechapel, which had been organised by the Tayyibun Institute whose headquarters are less than a mile away in New Road (more about them another time). The Tayyibun had invited Abu Abdissalam to teach women about the kind of child rearing techniques that would deliver “a victorious Ummah”. However, as I noted in January, someone at the council had done their homework on Abdissalam and insisted his name be removed from the list of speakers before the Brady could be booked. Believed to be aged in his 30s, he was born in Coventry and raised in London. He gained a degree in Computer Science from City University and then went to study Islamic Studies in Saudi Arabia. He doesn’t much like the West […] in fact he appears to be brimming with anger. Full details about him can be seen on the Harry’s Place website here. He makes references to the stoning to death of adulterers, chopping off the hands of thieves and to Ali Al-Timini, the US cleric convicted for plotting terrorism in the wake of 9/11. 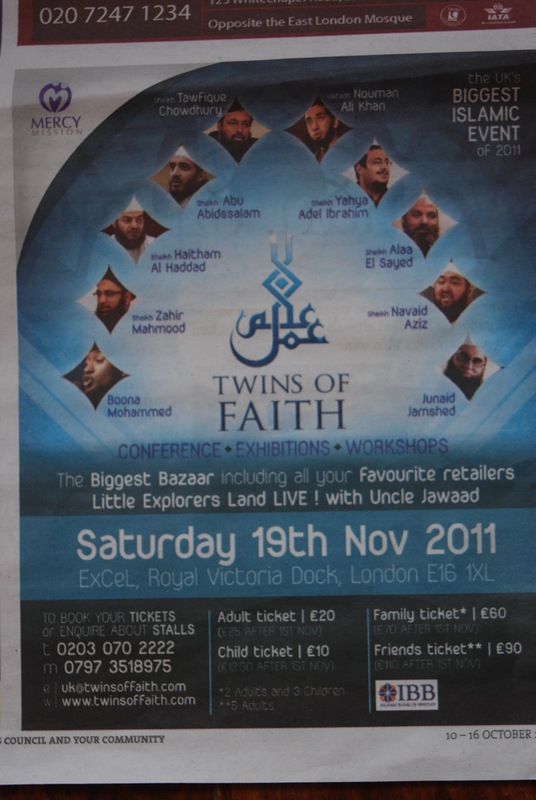 It’s an advert for the Twins of Faith event at the Excel Centre in Newham. As you can see, Abdissalam is one of the speakers. The publicity on its website here says the event, which will have “fully segregated seating” will be all about “inspiring positive change”. If the council really is sincere about rooting out extremist thinking and prove that it really is getting a grip, it has to demonstrate that it is aware of these issues across all its departments and not just showboat on the obvious bookings of halls. This is particularly so of East End Life.We’re told that the editor has “independence” from communications boss Takki Sulaiman but who is overseeing the paper’s advertising team. The problem is that that team, which is run by Chris Payne, is driven entirely by monetary targets. They’re not well-trained: they’d be able to spot Nick Griffin’s name on an advert but not many others. This is not the first time it has accepted these kinds of adverts is it? A few months ago, East End Life was running adverts for Anjem Choudary’s new evening school in Whitechapel. After those ads were highlighted here, none have since appeared. Its vetting procedures need to be strengthened. I’d suggest that they have stronger links with a body such as the Quilliam Foundation to advise on whether there are potential problems when requests for such adverts come in. All this, of course, is very helpful evidence for Eric Pickles, Grant Shapps and Bob Neill, who, as predicted said here last week, will be looking at ways to bring these council newspapers on to a statutory footing. Two weeks ago, I expressed astonishment that Tower Hamlets Council was promoting a Lutfur Rahman-supporting “newspaper” run by someone who had published disgraceful wife-beating smears about former Labour mayoral candidate Helal Abbas. You’ll recall that someone in the council had decided to reserve space in the town hall’s newspaper ‘bin’ (alongside East End Life) for free copies of East London News, the successor to London Bangla. When I raised this with the council, communications head Takki Sulaiman insisted there was nothing wrong. Tory leader Peter Golds then complained and now embarrassed Takki has been forced by his bosses into a U-turn. I am writing in response to your enquiry regarding East London News. A decision was made in early August to allow 5 copies into reception following a request from the publisher. This decision was taken on the basis that we allow other newspapers as well. As you know, the Council is not responsible for the editorial content of the newspapers. The Council has reviewed this decision and we have decided to exclude all newspapers from reception. This will be hard for some of the journals but the Council does not want to be challenged for allowing one and not another. It cannot be guaranteed that ELN will never appear in the reception area as often people bring it in and leave it around. Facilities Management staff have been instructed to do regular checks. Finally, we will still allow journals like college prospectuses etc as they provide a service to residents. If you would like any further information please do not hesitate to contact me on the numbers above. But even now, Takki can’t resist to mislead. There were far, far more than five copies when I picked up mine.